“I really discovered the benefits of meditation when I became Buddhist. I travelled to Bangkok and spent several weeks living with the Buddhist monks and learning as much as I could about meditation. But like the Dalai Lama, my beliefs are not only spiritual, but I also require hard scientific evidence. What I learnt was that the best way to live our lives is to be in the present moment. Not being lost in thought about the past, or worrying about the future, not being distracted or overwhelmed by difficult emotions. Instead learning how to be in the here and now, how to be mindful and how to be in the present. It sounds so ordinary and easy, but the truth is that it is anything but ordinary. PilatesEVO Mindfulness Meditation Exploring Difficulty is one in a series of guided Mindfulness Meditations delievered by Chris Hunt and available here in the PilatesEVO shop. 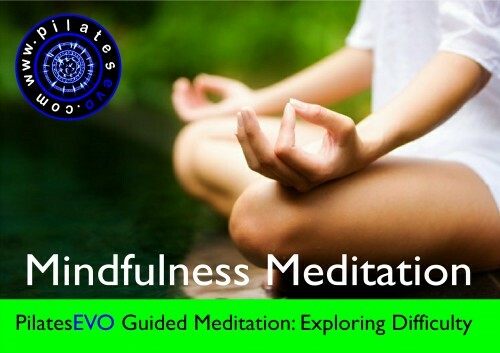 You can read more about Mindfulness Meditation in an article written by Chris called Meditation Explained.